The Fiat-Shamir construction (Crypto 1986) is an efficient transformation in the random oracle model for creating non-interactive proof systems and signatures from sigma-protocols. 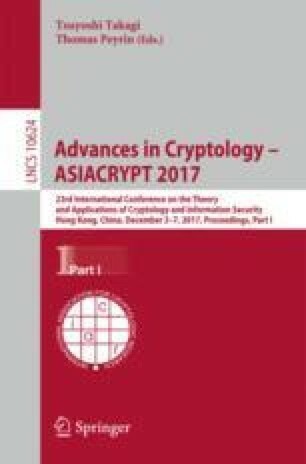 In classical cryptography, Fiat-Shamir is a zero-knowledge proof of knowledge assuming that the underlying sigma-protocol has the zero-knowledge and special soundness properties. Unfortunately, Ambainis, Rosmanis, and Unruh (FOCS 2014) ruled out non-relativizing proofs under those conditions in the quantum setting. In this paper, we show under which strengthened conditions the Fiat-Shamir proof system is still post-quantum secure. Namely, we show that if we require the sigma-protocol to have computational zero-knowledge and statistical soundness, then Fiat-Shamir is a zero-knowledge simulation-sound proof system (but not a proof of knowledge!). Furthermore, we show that Fiat-Shamir leads to a post-quantum secure unforgeable signature scheme when additionally assuming a “dual-mode hard instance generator” for generating key pairs. I thank Andris Ambainis, and Ali El Kaafarani for valuable discussions, and Alexander Belov for breaking the Quantum Forking Conjecture upon which earlier versions of this work were based. This work was supported by institutional research funding IUT2-1 of the Estonian Ministry of Education and Research, the Estonian ICT program 2011–2015 (3.2.1201.13-0022), and by the Estonian Centre of Exellence in IT (EXCITE) funded by ERDF.